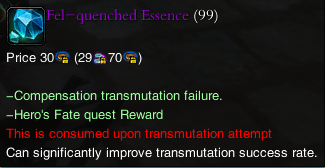 I’ve found some useful information regarding this new “gear transmutation” system. To add another attribute to your gear. So re-ID-ing has nothing to do with it (unlike adding another identified attribute with augmentation), and any piece of gear can only have one. Currently, you can only add basic attributes (attack, typed attack, defense, typed defense, accuracy, evasion, mana, HP); no HE, crit. %, etc. 1.) Get a piece of gear with the desired ID, and use a transmutation book on it with the same attrib as the desired ID. If you need HP, then get a piece of gear with HP ID, and use the scroll on it, like you use an ID scroll. The gear needn’t be an “Ancient Arena Gear” drop from the new … Mines instance; anything will do, but to improve purple gear, purple base gear is advised, as the result will be better. For this, these gears are a good source. The gear is the source gear. The scroll is the appropriate book. The stones are just like start crystals and recharging star fragments, improve success rate. All items used will be destroyed. If you’re successful, you get your activated book. 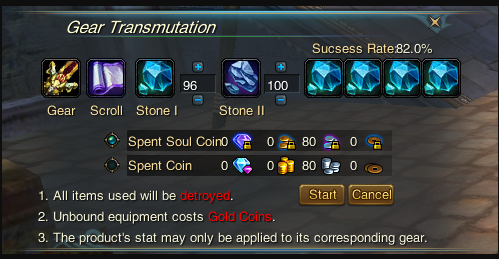 If you fail, you may get a stone to use in your next transfer. 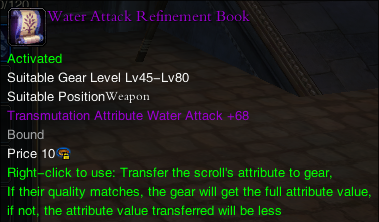 This seems to be pretty straightforward: you can apply this +68 water attack attribute to any lvl45-80 weapon. If it already has a transmuted attribute, it will be replaced. Well it depends on the price of the stones used. Everything else seems to be free, you just need some storage space to keep them in. It doesn’t provide OP stats, but +100 attack or defense from your gear set is more than nothing.